I would like to sincerely thank the authors James L. Schaller, MD, MAR, and Glenn A. Burkland, DMD, and anyone who helped them in publishing their MedGenMed article entitled, "Rapid and Complete Control of Idiopathic Hypereosinophilia with Imatinib Mesylate." This was obviously made possible by the ongoing efforts of all those involved with the publication efforts at Medscape. It is a shame that it took me so long to discover this article -- just over the past summer (August 2006), but if I hadn't, I know that my life would be in much greater jeopardy. The prognosis of my very rare blood condition (hypereosinophilia) is not good, but with the help of the above-mentioned article my life has literally been saved. The publication of this article caused me to begin taking the new miracle drug, Gleevec. Although it is known for its fantastic results in the treatment of chronic myeloid leukemia, very few people know about its potential benefits to those with my very lethal condition. Figure 1. — The lab results for author Shinkarow's condition before and after treatment. Schaller JL, Burkland GA. 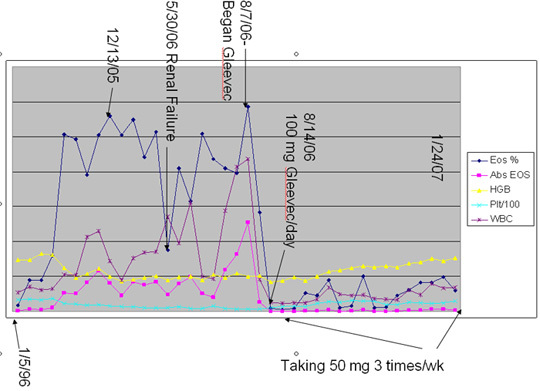 Rapid and complete control of idiopathic hypereosinophilia with imatinib mesylate. Medscape General Medicine. 2001;3(3). Available at: www.medscape.com/viewarticle/408170. Posted September 7, 2001. Last accessed February 9, 2007.